I am joining Kim Klassen's Texture Tuesday - And Then Some eDition. I couldn't do just one photo with this texture.... Pop on over to my photo/quote blog to see another picture that I used this texture on. I know that truck...oh how I love that truck:) Beautiful texture work, dear friend! This photo is gorgeous and that texture is so perfect! Fantastic vintage feel...love the subject too. LOVE it. Another one of my favorite subjects is old trucks and cars. They are always so good for textures. Fabulous work! Love that truck and your processing fits it perfectly! Wow...I love this one!! Great job. 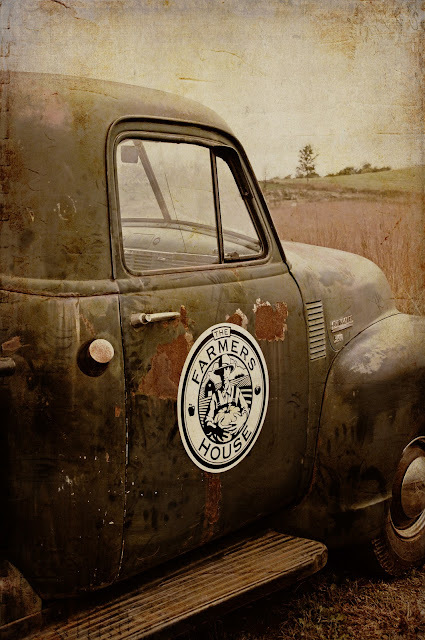 nothing like a beautiful old truck and a wonderful texture. gorgeous sheila!! I would love to have a truck like that around here! I'd be photographing it every which way!!! Great job! I love photographing vintage vehicles. Great job on this photo! I am in with everyone else. Great vintage feel, framing, processing and texture! Very nice, Sheila. Thanks so much for your nice note of support. It's a rocky road here! I need to learn that texture technique! Very impressive indeed.